What the hell do people get out of driving? You sit down in a car. You put your foot upon the accelerator. And you travel from point A to point B without killing anybody. Simple. Right? Well, no. Not to the Director: Hal Needham; or his Actors: Burt Reynolds, Dom DeLuise, Farrah Fawcett, Dean Martin, Sammy Davis Jr, Roger Moore, Jackie Chan, and Peter Fonda. Especially for 95 minutes in 1981. Put your pedal to the medal and get set to watch the cross-country road race of a lifetime. That's right! Racing season is here once again. And the 'Cannonball Run' is primed and ready for a shed load of competitors to drive like maniac's from Connecticut to Los Angeles; giving them all the excuse they need to burn rubber, break speed, and rocket they're way from point a to point b in the fastest time possible. Yep. That's right. I said 'Foyt'. Who takes an instant disliking to this competition night on straight away, and quickly investigates what it’s all about. J.J. McClure and Victor Prinzim (Burt Reynolds and Don De Luise): JJ and Victor are a couple of jovial road hogs whom eventually decide to drive an ambulance in this race. JJ is the self-appointed leader out of the two, coming from a racing background and a jaded lifestyle. Whilst Victor, on the other hand, is a menial chap, with a split personality that manifests itself in the form of a ‘hero of the people’ -- labelled Captain Chaos. Over time, this contrasting pair find an animated doctor to ride with them, (Jack Elam), as well as picking up and hijacking Pamela Glover, after passing a roadside accident involving Arthur J. Foyt. Jamie Blake and Morris Fenderbaum (Dean Martin and Sammy Davis Jr): Jamie and Morris drive a red Ferrari 308 GTS in this competition. Also, both garbled as priests and drunk as newts, they cause havoc on the roads because Morris has placed a bet with ‘Nick the Greek’ for them to win this competition. Jill Rivers and Marcie Thatcher (Tara Buckman and Adrienne Barbeau): Jill and Marcie are two buxom beauties clad in tight fitting cat suits and driving a black Subaru GL hatchback. Together, they use their feminine wiles to overcome any obstacle that come their way. Male obstacles that is. Jackie Chan and Michael Hui (Yep. It's really them): Jackie and Michael are a pair of Chinese experts well known in their respective fields. For Jackie it’s his driving prowess. For Michael it’s his technical savvy. And combined, they developed a computer aided automobile to beat ‘the Americans’ in the Cannonball. Roger Moore (Seymour Goldfarb Junior as he is known by his Mother): Roger drives a gadget riddled Aston Martin DB5 in this race. And with the help of this erstwhile vehicle, his showbiz credentials, and many of the lovely ladies he picks up during his travels, he rides the light fantastic towards the finishing line. The Sheikh (An Arab): The Sheikh and his somewhat reluctant henchmen, drive a Rolls-Royce Silver Shadow though America, paying his way with big bucks and boisterous bravado till he can reach the promised land of Los Angeles. And dare I say it... many, many more. One by one, each of these wacky racers drive their vehicles of choice from coast to coast, trying their best to avoid any obstacles that halts there transit. 'Now what obstacles are these?’ you may ask yourself. Well, for a start, there is the danger posed by Arthur J. Foyt, who try’s to bar the ‘cannonballers’ path with a commanding police presence. Next, there's the police themselves, who try their best to stop any wrong doings along the public highways. And finally, there are a couple of hell's angels (led by Peter Fonda), who start a fight with the cannonballers at the foot of a road-works. Now before I praise this film like a man possesed, let me just state that 'The Cannonball Run' is very real race in America, where many a car enthusiast ride their mode of transportation throughout the land of the free (for a fee of course). It's been running (excuse the pun) since the mid sixties (though I could be mistaken), and has had a bit of a track record throughout its turbulent existence. However, 'The Cannonball Run' movie doesn't try to depict the earthy nature or this very real life event at all. Oh no. Instead it’s... err? It’s... ahh? It’s... err? How can I put it? This film doesn't weigh itself down in fact. This film doesn't weigh itself down in story either. But what it does do, is present a rather jovial and jolly take on a cross-country racing competition, garnishing itself with all the charm of the then celebrities of the nineteen-eighties. Heck, I'd even go so far as to say that every single celebrity has a moment in the spotlight within this fractured film. With most of them just funny as f*ck all the way through it (f*cking can be funny if you are doing it right). Granted, some celebrities are shown more than others -- as Jackie Chan is only utilised in a minimal way, merely touching the surface of what he can do martial arts wise. But still. This is not a Kung Fu film. Right? It’s an American racing film. Filled to capacity with comedic hi-jinks that have been plagiarized ever since. Yeah! Straight up! For example, you'd get to see: (1) Sexually clad ladies using their... ahem... assets to their advantage, and coming out on top. (2) A film with no real story but rather a premise which allows characterisation to flourish and personality to bloom. (3) A gag reel in which we get to see all the silly mistakes the actors have done during production. And (4) The charm and grace of people being themselves in character. And this -- for me -- is what makes ' The Cannonball Run' a great achievement. It defies convention by replacing relevance and story with character and charm. Something that just can not be done today. Furthermore, there are also the filmic-facts! (1) '20th Century Fox' first released this $18 million dollar production on the 19th of June, 1981, and clawed back $72 million dollars at the box office. (2) Originally this movie was going to be a vehicle for Steve McQueen, yet after he died, the producers made it into a comedy starring Burt Reynolds instead. (3) Hal Needham, who directed this flick, also had a number of small cameos in it too. He was the EMT in the back of the ambulance. He voiced the cop who said 'Remember when we use to chase speeders'. He was the truck driver who called Roger Moore on the CB radio. Plus you can clearly see him in the end credit blooper reel. (4) The Sammy Davis Jr. role of Fenderbaum was originally given to Don Rickles. He didn't want it though. (5) Jackie Chan wasn't too keen on this project for two very specific reasons. Firstly, he wasn't very happy about his own performance. And secondly, he hated the fact that he was called Japanese, not Chinese. 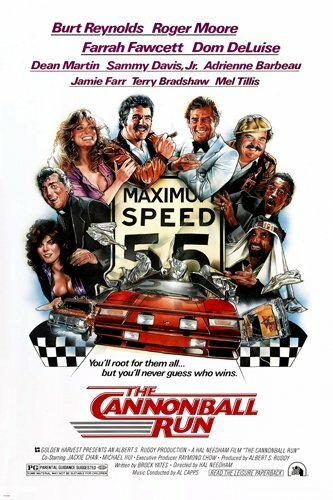 (6) The full name for the real 'Cannonball Run race' was 'the Cannonball Baker Sea-To-Shining-Sea Memorial Trophy Dash'. (7) 'Jimmy the Greek' is a legendary odds-maker, and he he was cast in this adventure because he and Dean Martin were both childhood friends from Steubenville, Ohio. (8) Even though Roger Moore had a variety of different 'lady friends' in this movie, all of them were voiced by the very same unaccredited actress -- June Foray. (9) I kid you not, the first highway-patrolman that pulled over Adrienne Barbeau and Tara Buckman in their car was actually Burt Reynolds stand-in. (10) I'm afraid to say that the stuntwoman, Heidi Von Beltz, was left a paraplegic, when the stunt she performed in an Aston-Martin didn't go according to plan. (11) Despite this film being filmed in only 36 days, Burt Reynolds still received the then-record $5 million dollars salary for appearing in it. OK. I know that I could go on and explain to you why I thought this movie was so funny and so full of life. But I won't. No. No way. I don't need to. All you have to do is click on the following video clip. Boy-oh-boy! What a classic all-star cast film! It's brilliant. Nuff said.